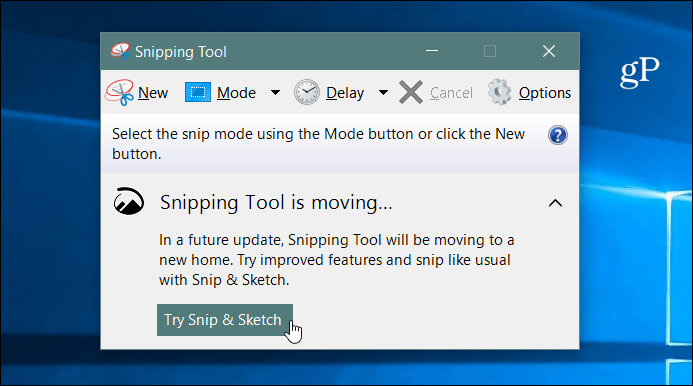 Microsoft is deprecating the Snipping Tool for screenshots and consolidating it with Snip & Sketch which is just as easy to use but more features. 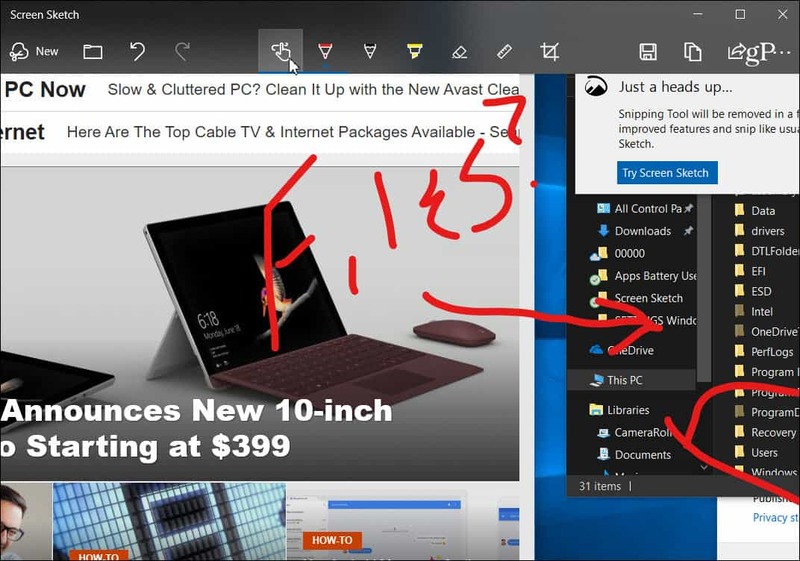 Starting with the next Windows 10 feature update, the classic Snipping Tool is being replaced with an improved screen grab app called Screen Sketch. It was actually introduced with Windows Ink Workspace and is now being used as a standalone app for the screen snipping experience. It supports most of the same features you’re used to in the Snipping Tool with additional improvements like annotating your screenshots and easier sharing. The new Screen Sketch was first introduced with Redstone 5 Build 17661 and will be available with Windows 10 1809 — which, at the time of this writing, is expected to roll out this fall. If you launch the Snipping Tool, you’ll see the following message letting you know it will be removed and consolidated into the new Snip & Sketch tool. To take a screenshot, launch the Screen Sketch app and click the New button or use the keyboard combo of Ctrl + N.
Just like with the Snipping Tool, the screen will gray out and you’ll see a few options at the top. The buttons offer different ways to take a shot like Freeform, Region, or Full Screen. 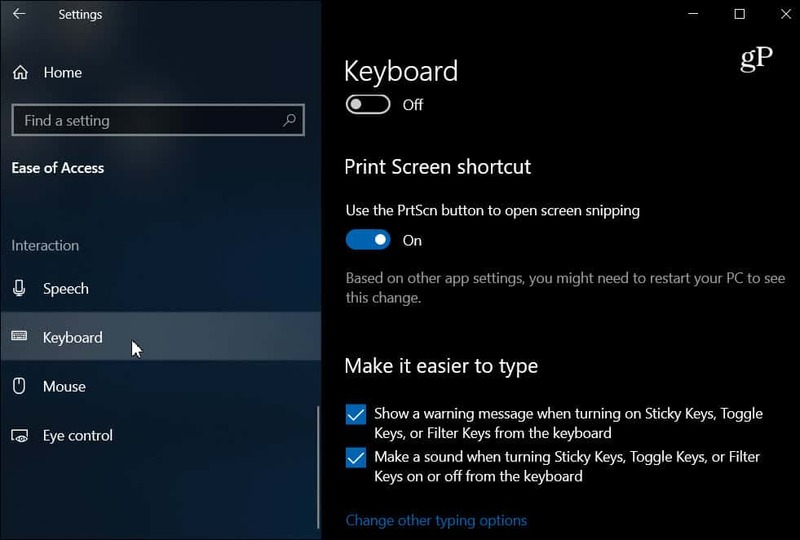 You can also use the key combo of Windows Key + Shift + S to directly start a region shot. Once you take your shot you’ll see several options for ways to annotate it. There are different options in the Screen Sketch toolbar like a ruler, different ink colors, cropping, etc. 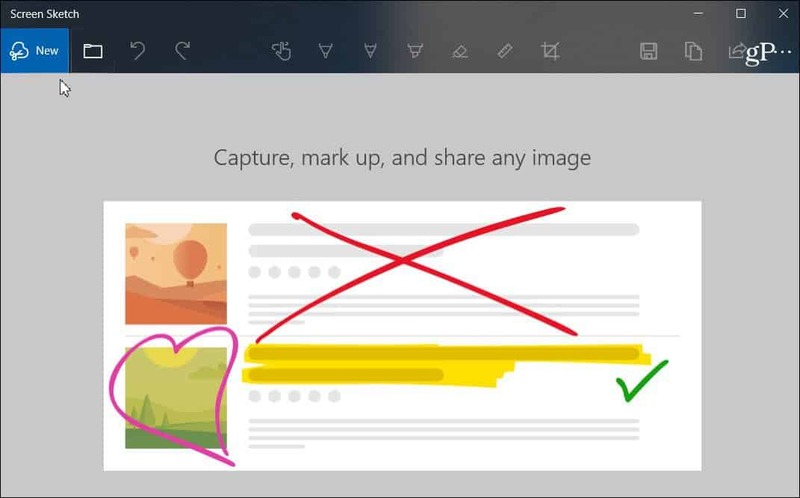 It’s similar to other Windows inking features like with Ink Workspace or what you see when you annotate an eBook in Microsoft Edge with your finger. Of course, if you have a Surface Pen you’ll have several more features and settings to configure. To share a shot, click the Share icon in the upper-right corner of the app and you will get a list of apps, people, and devices you can share the file. 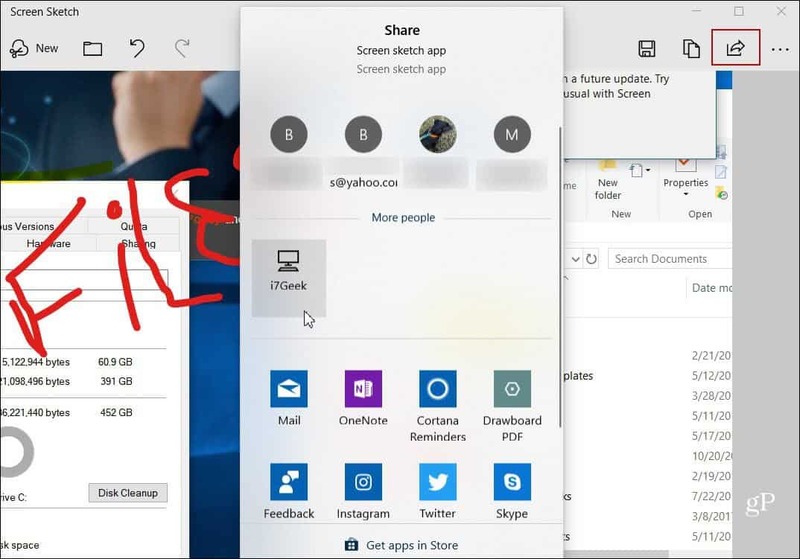 The experience is similar to other sharing features in Windows 10 like Nearby Sharing. You can also make the PrtScn key to launch screen snipping. Head to Settings > Ease of Access > Keyboard and turn on the option under the “Print Screen shortcut” section. We have covered ways to take screenshots on all platforms and the new Snip & Sketch tool is a great way to grab, markup, and share your screenshots from Windows 10. When it officially rolls out, users of the current Snipping Tool should find it just as easy to use. It’s just as responsive and intuitive but with more features. Well, that sux, because I like Snipping Tool and use it a lot (particularly to grab Twitter notes). However, I also have a similar, older “tool” that allows me to capture a scrolled screen and video, so it is actually better, just takes a few more steps. Windows is also relieving us of the horrible “Paint” software, which I use a lot, and MS is going to replace it with something they say is in the Store but it’s not there yet. I don’t much like the Store anyhow, I don’t want to be in their databases. I’ve replaced the lovely simple “Paint” with an older version of PhotoScape (I think newer version is in Store, too, drat), though I’ll still use Paint while I can to reduce the size of some of my photos (so simple!). I wish instead of deleting useful free software they’d offer the option to keep the “old, outdated” software *and* the new one — and use both if we wish to. It’s another case of MS being certain they know what is good for us… and being wrong. DebbyS – here are a few freebies that you might want to try out: Gadwin PrintScreen, Snipaste, Snap2HTML, and Picpick. Just google them and download from a reputable site and check the installer/s at VirusTotal to make sure that you have clean installers or alternatively use your own a/v. Good luck and, again, I share your frustration with Microsoft and their inane thinking that “old” is no good – sometimes the best programs are the older school varieties that make life a little easier for folks like us. DebbyS – forgot to also mention Joeffice (Java based) and Jarte (which can also be run as portable). Some more free snipping tools: Free Screenshot capture, EasyScreen OCR, snap crab and greenshot. Greetings from Oz and safe surfing! Ziggy, thanks for more ideas! I did download and will try Snipaste (it looked the easiest), but now you’ve given me more to check out :) Thank you also for the ideas for wordprocessing programs. I did at first download/install LibreOffice, but I’ve been too lazy to learn the differences (there are quite a few different key combos), and when I tested to see if Word 2000 would load okay and it did… I’ve been sticking with it for as little as I have to wordprocess because I know it already :) The 5 WP programs you suggest though may be even better, and it’s good for readers here to have those ideas. @DebbyS. You are most welcome! How did I forget? Probably one of the easiest and better screen captures is Duck Capture! Duck capture! Now that’s an app I’ve never heard of before. Thanks for the FYI Ziggy. I’ll have to check it out. I tried this under V1809 update. = Any changes to the capture is NOT in the clipboard. It only holds what was captured. I can use CTRL-C do that but it isn’t like the old SNIPPING TOOL in that all changes went into the clipboard as well. = There is NO WAY I can ROTATE either the ruler or compass? I have a Logitech M705 wireless mouse on a desktop PC. Supposedly this is done using the left mouse button and wheel, but all that does is move the clip up or down? I even updated my mouse s/w (Setpoint) in case that was the problem.